If you don't already know this from personal experience, you can get a quick education in social media's detrimental effects on romance from any number of studies showing direct correlations between Facebook (and Instagram, Snapchat, and even occasionally Twitter) and increased levels of cheating, breakups, jealousy, and potential doom in younger couples. There’s even a connection between Facebook users and the divorce rate. 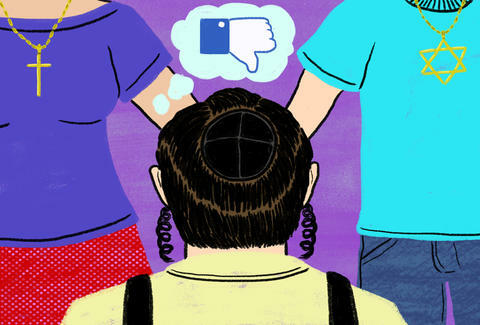 But Facebook tested my relationship in a surprising way for 2016: by invoking backlash from friends and family in the Modern Orthodox Jewish community when they discovered one of their own was to marry me: a woman who was only half Jewish. My fiance Lee is a Brooklyn native who was raised in close proximity to relatives in a Modern Orthodox community where bonds were tight and secrets scarce. It was during college that Lee decided to quietly break with his religious roots. Nobody had to know, he figured, leaving the family unscathed by his departure. Meanwhile, I was raised both Jewish (dad) and Catholic (Italian mom). I considered myself, colloquially, "Buddish.” As an only child, the small clan I was raised in was a far cry from Lee's experience growing up. When we began dating, Lee’s family initially assumed that yes, “This was a fine match!” since I was oh-so-lovely and oh-so-Hovitz. That is, until his brother (prone to pot-stirring) spilled the proverbial beans all over the dining room table. News was out of the religious blending; and wasn't contained by immediate family members or households. My fiance started footing calls from frantic family members telling him what a mistake he was making. His sister feared he would bring shame on the family -- and that she would never find anyone to marry her. Lee had to defend his choices to his own siblings, and to some of his friends. And, admirably, he stood his ground. At first, Lee's mother thankfully decided she would rather have a son living in sin with a Shiksa Goddess than no son at all. She dutifully welcomed us into her home and we did the same. She tried. She really did. We met on several occasions and had a wonderful time together, and I could tell how torn she was. It wasn't 24 hours after our engagement announcement found its way into people's Facebook feeds that the real hysteria began. That one word -- engaged -- caused such an uproar in Lee's old community that people called his mother and accosted her at the grocery store. She was berated and humiliated among people she had known for decades. She, in turn, called Lee. “Why did you have to announce it?” she shrieked into the phone. “When people leave the community, they leave quietly.” She was cracking under the watchful eye of the Orthodox community. “What year is it?” our friends and peers asked rhetorically when we told them what was happening. Some people got very angry; while older folks replied with their own stories about how it happened to a friend, brother, or guy they used to work with. I’d be lying if I didn’t say this backlash didn't put a big strain on my relationship with Lee. Watching the big happy family I’d always wanted disintegrate was heartbreaking. And having to run damage control during what should have been a celebratory time, sucked. But while tensions ran high, I leaned on Lee harder than ever before. I watched how he handled people. And I found an even deeper admiration for this man who could respectfully communicate his values and try to reason with people -- even when the people he was trying to reason with were inflexible and rude. And I realized, more than ever: we had something worth fighting for. Lee and I were fortunate that dealing with the backlash ultimately brought us closer together. The biggest strain wasn't between the two of us: it came with trying to deal with everyone else. And that, I realized, was how a relationship should be: a united front facing the world. Meeting bigotry with understanding, compassion, and reason was our plan of defense. Still; in the end, we were down about half of our wedding guests. We managed to find just one friend of Lee's willing to take the “risk” of being in the wedding party. What you may have thought was a centuries-old practice of shaming and shunning people for marrying outside of their religion is still pertinent right here in the US; even in New York City, the capital of all things progressive. And it was coming from all sides -- not just from people we knew. In the wee hours of recent Saturday morning, I got a Facebook message from a woman I didn't know who was "just trying to help” because the Jews “are a proud people.” She suggested I find myself another fiancé so we wouldn't reap the "sociological and biblical consequences" of our pending nuptials. ... and neither should anyone else, no matter what your race, religion, gender, age, or any other identifiable factor. There will always be online trolls, and disapproving family members and friends. If we're going to be on social media, we need to remember that we’re setting ourselves up not just for thumbs ups and heart emojis. If you're going stand for anything at all -- true love, religious freedoms, speaking your mind, defending what's right -- you're going to face tests and challenges. The love between Lee and I won. We supported and listened to each other every step of the way. In this way, our confidence grew. And with our wedding date approaching, I know now -- more than ever -- we made as right a decision as ever could be. Helaina Hovitz is an editor, journalist, author, and media start-up co-founder living in New York City.